Thomas from Austria continued his Thailand freshwater stingray fishing holiday with a visit to the Maeklong River at Samut Songkran. Timing the fishing to coincide with the daily tidal influx saw the angler moored on a quiet section of the river on a wide bend. With the incoming tide beginning to raise the water levels everything looked good for a bite from a Giant freshwater stingray. After fishing for barely an hour the angler was alerted to a ticking sound as one of the big game multiplier reels began to slowly release line. With the rod tip nodding towards the surface the angler quickly wound down into the unseen stingray making the big game rod bend into its parabolic curve. A short ten minute battle followed which saw the Giant freshwater stingray characteristically clamping onto the bottom of the riverbed requiring the angler to lever the stingray from the muddy substrate. Moments later a small male Giant Freshwater stingray was brought over the waiting net and quickly transported to the riverside. 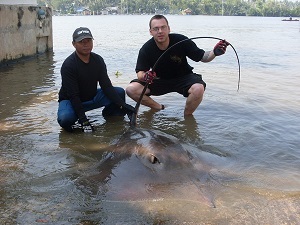 The Giant freshwater stingray was estimated to weigh 40kg’s and was identified as being a male. The stingray was released back into the river after a few quick trophy shots were taken on the camera. Returning to the productive area the angler wasted no time in repositioning the baits at intervals across the wide section of tidal river. An hour passed before another multiplier reel burst into life indicating the arrival of another freshwater stingray. Thomas immediately wound down into the stingray which saw the stingray respond by stripping several yards of line from the tightened clutch. A fifteen minute battle followed which saw the angler tested to his limit as the unseen stingray embarked on a series of powerful runs. The boat was moved above the stingray on each occasion allowing the angler maximum leverage from above. After removing the stingray from the muddy substrate on several occasions the stingray was finally prised from the riverbed where it was played out in open water. After bringing the stingray alongside the boat it was netted on the second attempt before being brought to shallower water. The Giant freshwater stingray was observed to be a larger specimen than the last stingray and was estimated to weigh 60kg’s. The freshwater stingray was observed to be a male and was released after photography.